Apple just released Mac OS X Lion for Macs. You must already have Snow Leopard (10.6.8) installed on your machine with the Mac App Store to be able to buy the new software update for $29.99. The update comes with many great features such as Multi-Touch Gestures, Full-Screen Apps, and Launchpad. Some of these new features came to the Mac because of well they worked on the iPad. 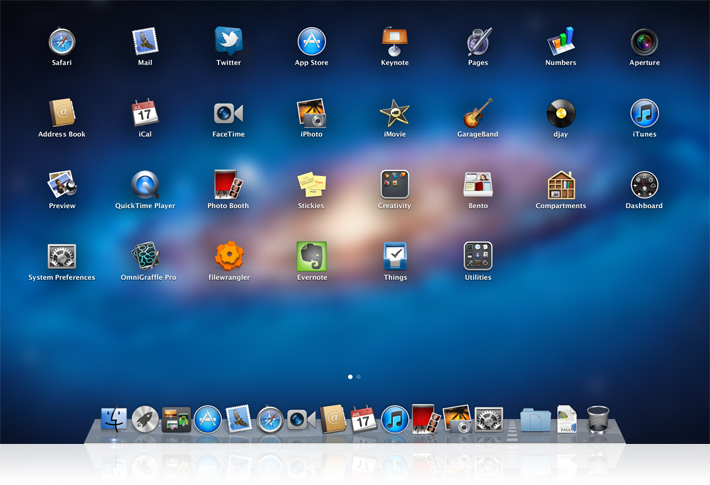 Launchpad is a new way to view all of your applications that looks just like an iPad screen. You are also able to organize your apps into folders just like on iOS. Full-Screen Apps are also taken from the iPad. For the first time on OS X this allows you to take advantage of your full display and cut out the clutter of the dock and other apps that are open. The Mac App Store is also new. Apple has had incredible success with the App Store on iOS with 15 Billion downloads. They have now incorporated the Mac App Store into this new OS update that allows you find the right apps for your Mac, all in one place. Multi-Touch Gestures are a main feature in almost every iOS app. With all Macbooks having a multi-touch trackpad this makes it so most Macs can use this feature. Even if you have an iMac you can easily purchase a Magic Trackpad to allow you to use these new gestures. These gestures allow you to quickly jump to Mission Control where you see all open apps, to swiping left and right to jump between other open apps in Full-Screen mode. No need to waste any more time. Go start the download now because the 4GB file might take some time depending on your connection. Let me know how it goes.